Deposit checks 24/7 without having to leave the office. RDC captures check images and easily exports them to your financial system. Using a special scanner provided by ECCU1, simply scan your checks, review your deposit and securely submit online. With RDC you have the ability to download, report and even email your deposit information with same day adjustment notifications. Deposits made before 4:00 p.m. (PT) on normal business days are posted to your account the same day. Already have remote deposit capture? Use Image File Deposit (IFD) to securely transmit files2 of images to ECCU for deposit. Easily deposit up to $10,000 per day while you're on the go with your Smartphone or Tablet. 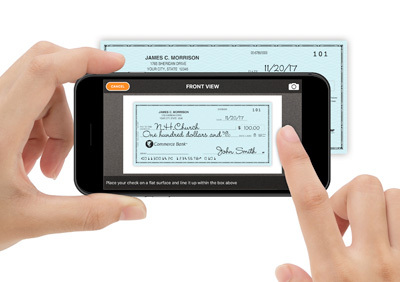 Download the app and follow the on-screen instructions to take a picture of your check and choose which account to deposit in. It's simple and secure! Shared Branch: Enjoy full service banking, including deposits, withdrawals, transfers and more, at thousands of credit unions nationwide. ATM Deposit: Cash or checks at over 8,000 CO-OP Network deposit-taking ATMs in the United States. CO-OP is part of a nationwide network of Credit Unions. Deposit unlimited volume of cash and checks in a secure manner that protects your staff and volunteers. Transport your cash and coin deposits to your local cash vault for deposit using a courier service. Ideal for ministries that have large amounts of cash on a regular basis or in peak periods. Contact ECCU for vault locations and options. For more information or support on RDC deposits, see ECCU's Remote Deposit Capture User Guide. 1Scanners are the property of ECCU and are provided for member use free of charge.